Felony cases relating to immigration and the Mexican frontier are swamping federal courts along the southwestern U.S. border, clogging courtrooms and forcing judges to handle hundreds more cases than their peers elsewhere in the country. Judges in the five, mostly rural judicial districts on the border carry the heaviest felony caseloads in the nation. Each judge in the state of New Mexico, which ranked first, handled an average of 397 felony cases last year, compared to the national average 84. Federal judges in those districts — Southern and Western Texas, New Mexico, Arizona and Southern California — also handled a third of all the felonies prosecuted in the nation's 94 federal judicial districts in 2005, according to federal court statistics. While Congress has increased the number of Border Patrol officers to try to control the nation's porous border, the pace of the law enforcement has far eclipsed resources for the court system. The effect is on display in courtrooms every day. Judges say they are stretched to the limit and need help. "The need is really dire. You cannot keep increasing the number of Border Patrol agents but not increasing the number of judges," said Chief Judge John M. Roll of the District of Arizona. A bill by Republican Sen. Pete Domenici of New Mexico, co-sponsored by Republican Sen. Jon Kyl of Arizona and Texas Republican Sens. John Cornyn and Kay Bailey Hutchison, would add 11 new judges in Arizona, New Mexico, Southern California and West Texas to help shoulder the load. The measure has gone nowhere in the past two years. "I can't even tell you how much we need that," Roll said of the proposal. The bottleneck has even helped derail enforcement efforts. During a push to crack down on illegal immigration last fall, Customs and Border Protection floated a plan for New Mexico that would have suspended the practice of sending home hundreds of illegal immigrants caught near the state's border with Mexico. Instead, they would be sent to court. The idea, dubbed "Operation Streamline," was to make clear that if a person was caught in the United States illegally, he will be prosecuted. Alarmed, New Mexico's federal judges hurriedly reminded the Border Patrol that they lacked the resources to handle the hundreds of new defendants who would stream into the court system every day. "We said, 'Do you realize that the second week into this we're going to run out of (jail) space?"' Martha Vazquez, chief judge for the District of New Mexico, recalled telling Border Patrol chief David Aguilar. "We were obviously alarmed because where would we put our bank robbers? Our rapists? Those who violate probation?" she said. Border Patrol eventually dropped the idea. Officials said they could not get all the necessary agencies to accept it. It is estimated more than 1 million people sneak across the southwestern U.S. border illegally every year. In Arizona, the busiest entry point for illegal immigration, state officials believe almost 4,000 people attempted to enter every day in 2006. Many lawmakers, advocates and President George Bush suggest solving the problem by revamping guest worker programs and rules for employers who hire illegal immigrants, thereby eliminating the incentive for workers to sneak into the country. Bush promoted his latest proposal for new worker visas this month in the border community of Yuma, Arizona. In recent years, however, Congress has focused on increased enforcement. The Border Patrol now has almost 2,800 more agents than the 9,821 it had in September of 2001. 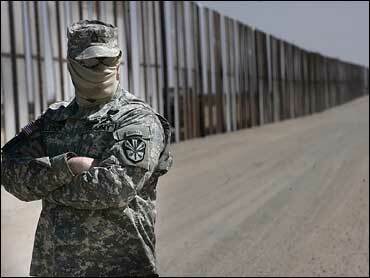 Another 6,000 National Guard troops have been providing logistical support to the Border Patrol since last May. Congress also has made available more than $1.2 billion for reinforcements, including fences, vehicle barriers, cameras and other security equipment. Homeland Security officials say the increased security is working. In Yuma, Bush said the number of people apprehended for illegally crossing the southern border is down by nearly 30 percent this year. Court officials say they still are in crisis mode trying to deal with all the defendants brought in by Border Patrol officers. Republican Rep. Darrell Issa, a staunch opponent of illegal immigration, has urged U.S. attorneys and courts to prosecute more illegal immigrants and pushed for more resources for both. But he has discovered that while his colleagues who do not represent the border are eager to add Border Patrol officers, many just do not realize the effect that has on the court system, said Issa's his spokesman, Frederick Hill. Politics is another barrier to adding judges. Even lawmakers from border states say they cannot justify adding judgeships in one district when other districts also need them. Democratic Sen. Dianne Feinstein says her state needs 12 judges besides the one the Republicans' bill would provide for the district in San Diego. "I'd be happy to support any bill that gives California its fair share," Feinstein said in a statement. "And I will seek to amend any bill that does not." Court officials say they have had to be creative just to try the cases they have. Visiting judges help in some districts. In Arizona, magistrates hold sessions on the weekends and have seen as many as 150 defendants in a day. In New Mexico, Vazquez, the chief judge, and former U.S. Attorney David Iglesias recently went on a Spanish-language radio station broadcast into Mexico to warn people about the sanctions for illegally entering the country. Court administrators have trouble keeping employees, such as interpreters, because of the grind. Judges' staffs struggle with exhaustion. Everyone fights to keep up morale as they hear countless sad stories from migrants who broke the law searching for a better life in the United States, which is not acceptable as a legitimate reason to immigrate. "It'd be swell to have another judge or two," said Judge George Kazen, who is based on the border in Laredo, in the Southern District of Texas. "It would mean a little more time to spend on civil stuff, and a little more time to reflect. We have to make quick calls and move on."